Today I should be sailing. It’s a tremendous southwest wind, sunny and warm. 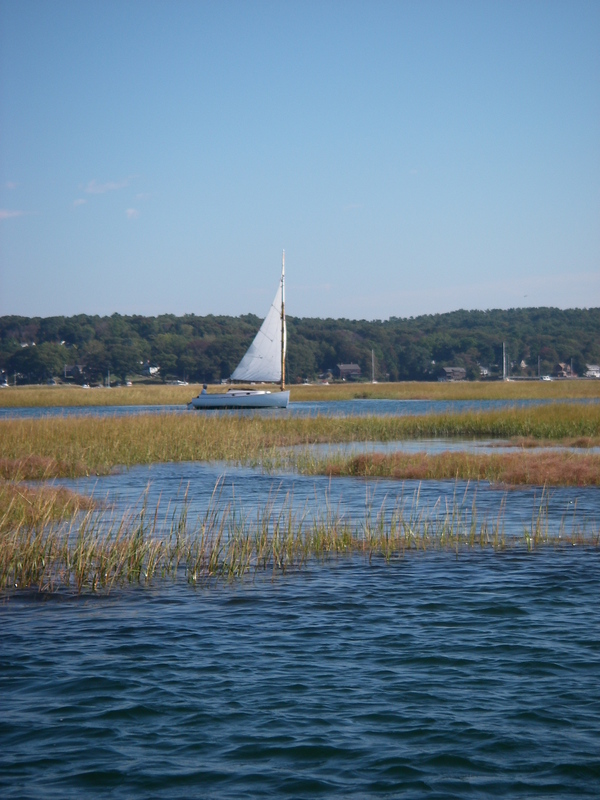 But it’s also a beautiful day to sit in this lovely anchorage and take in the colors of the marsh as the tide changes. I had big plans of sailing up to Plum Island sound today. But yesterday evening, looking again at the chart, I got to thinking how I didn’t really see a place to anchor that would get one out of the wind. And at high tide, or more likely, the top third of the tide, almost anywhere one went there would be a tremendous amount of open water in all directions. Tonight is forecast to blow 10 to 15 through the night, so that didn’t seem like much fun! Besides, yesterday turned out to be a busy day, and it’s nice to just relax. 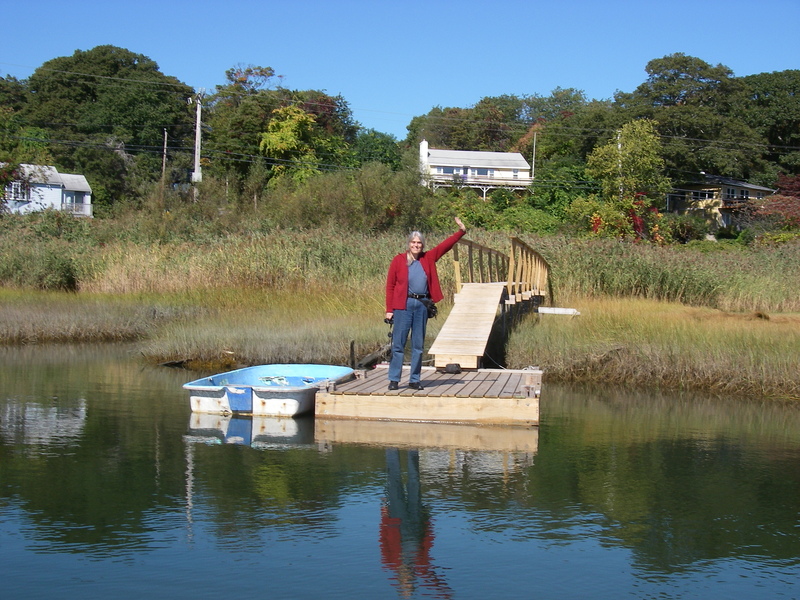 Two days ago, when the tide was almost low so the boat would fit under the closed railroad bridge, I left the Cape Ann Marina and came partway down the Annisquam River. After a peaceful night anchored in a small slot behind a sandbar – with an evening swim! – the morning tide was just right for a visit to Susanne Altenburger. She lives in the house that she shared with Phil Bolger, in the creeks in back of Pearce Island. What a treat it was to go in there, winding along on a light breeze in the channels among the grasses. We had a lovely visit at her dock, picking up our conversation from the other day about things like how one could conceivably modify AUKLET for travel in ice. I was quite taken, a few years ago, by the series in Small Craft Advisor about building the John Welsford design Sundowner. One of the things I loved about that boat and its construction was how incredibly sturdy it was (small, and double planked in a crisscross pattern with, I believe, 1 inch boards). I was heartbroken to see that boat go on the rocks – video actually on YouTube – but the sturdy hull would have been up to almost anything short of those ocean breakers on the massive rocks of the Australian coast. And now, here are some thoughts that would, using techniques different from Sundowner, also create a hull with that kind of sturdiness. And bonus, it would include copper sheathing! The end of bottom painting, and of worrying about scratches on rocks. The basic idea is to add 3 inches of foam sheet (in 1 inch layers, to allow for following curves) to the entire hull, followed by 1/2 inch of plywood, and then copper. The idea is that this would make it highly unlikely that a gouge from an unfortunate bit of ice would actually make it through the inner hull. As I’ve said before on this blog, I’m prone to worry – that many layers between the water and the inside of the boat would make ALL sailing quite a bit more relaxing! There are various details that would make carrying out this idea quite a substantial project, but it’s really nice to think about how it would be done. The winter project list for AUKLET is just comfortably doable at this point, and I do hope to keep it that way. But it’s outstanding to know about ways that one could go forward in the future. SERENITY, the Peep Hen, is not still in the garage for nothing! If AUKLET went into the shop for modifications, I’d have a great excuse to take a break on the giant travel and do some lovely small boat sailing.